Best Selling Postcode Map of England & Wales Showing Postcode District Boundaries. Postcode Districts are the First Half of the Postcode - everything before the space. Our Postcode is E22 3NX , Our Postcode District is EH22. This England & Wales Postcode District Map Clearly Shows Postcode District Boundaries and Associated District Labels (SL1, SL2) on a Comprehensive Background and is Ideal for.Determining Postcode Boundaries for Sales Territories, Logistics, Planning Mailshots or as a Regional Reference Guide.Our Huge 2A0 is Perfect for Easy Viewing Across the Office. Choose from our Large A0 (119cm x 84cm) or our huge 2A0 (168cm x 119cm) Postcode District wall map for easy viewing across the office. Up to date Postcode Boundaries and labels in red for clear viewing and quick reference. 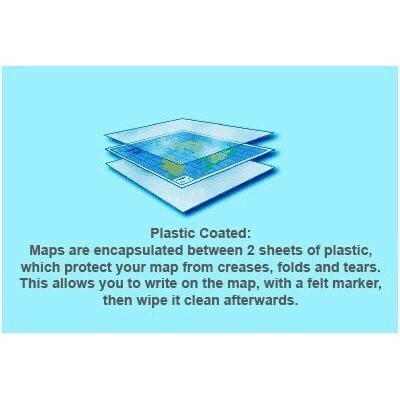 Choose either plain Paper or Plastic Coated on both sides with clear plastic to protect from creases, rips and spills extending the life of your map. Annotate your Plastic Coated map with sales territories, franchise areas or customer locations using water based marker pens and wipe clean again. Use marker pens on the plastic coated version and then wipe off - washable. Use marker pins, for example for client locations.